Viewers were instructed to write an insult that either they gave to someone else or one in which they received, on the head of a Prince Rupert’s Drop coated in glue and place it into a pint glass. 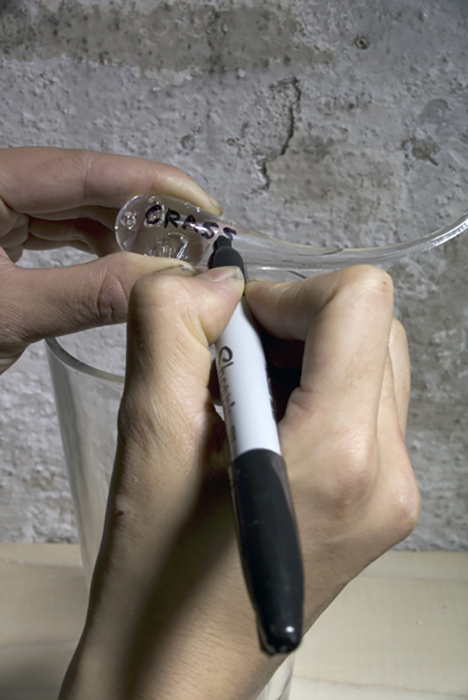 Next they were to break the tail of the Prince Rupert’s drop causing the written text to be shattered, deemed illegible, and projected onto the surface of the glass. The shattered remains of the drop were the to be dumped out onto the shelf leaving only an abstracted remnant of the original written insult. Being in a pint glass one could imagine the ability to drink in the experience and wash it down, but never fully erase it because like a Prince Rupert’s Drop, an insult is irreversible.